After a marathon 10-hour grilling on 23 April, the interrogation of ousted All India Anna Dravida Munnetra Kazhagam (AIADMK) leader T.T.V. Dinakaran continued today by the Crime Branch office of Delhi Police here, where he will be probed in a case involving bribing of an Election Commission official to get the party's 'two-leaves' symbol. 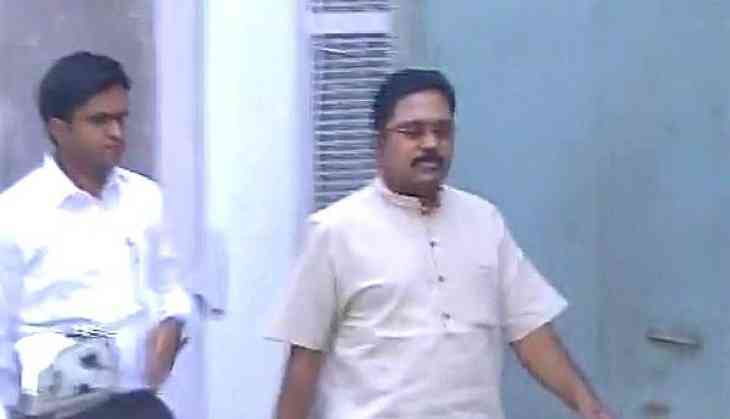 On 23 April, Dinakaran was cross examined along with his 'friend' Mallikarjuna and his Personal Assistant (PA) Janardhanan, sources state. They were quizzed about the money trail of the alleged bribe. Also the matter of Dinakaran staying over with Mallikarjuna for around 10 days after an FIR was filed against him, was also brought up during the interrogation. While the two men will be quizzed again today at 2 p.m., Dinakaran's questioning is set to continue at 4 p.m.
On Saturday, Dinakaran was given a set of questions by the Delhi Police in connection with the case. According to sources, Dinakaran was given a questionnaire and an Assistant Commissioner of Police (ACP) questioned him. The questionnaire included queries about the money trail, his association with Sukesh Chandrashekhar, the middleman alleged to have struck deal for Rs. 50 crore to help Dinakaran's AIADMK faction keep the 'two leaves' poll symbol, how many times he met Sukesh and whether any meeting with the Election Commission officials took place, or not, etc. On Thursday, a team of the Delhi Police Crime Branch reached Chennai and served a notice on Dinakaran and asked him to join the probe. The Delhi Police had issued a lookout notice against Dinakaran on Tuesday. The police had arrested and sent Sukesh to custody for allegedly striking a deal of Rs. 50 crore to help the Dinakaran faction keep the 'two leaves' poll symbol. The Crime Branch recovered approximately Rs. 1.3 crore and two luxury cars, a BMW and a Mercedes, from Chandrashekhar. Chandrasekhar was picked up from the Hyatt hotel and was produced at the residence of Special Judge Poonam Chaudhry, who allowed the Delhi Police's plea to interrogate the accused for eight days. Dinakaran was also named as an accused in the FIR, filed by the Delhi Police Crime Branch. Dinakaran's faction contested on the hat symbol for the R.K. Nagar assembly by-polls, after the Election Commission froze their two leaves symbol while acknowledging the split in the party. The polling was later cancelled by the Election Commission.